Vintage phones have been a staple collectible for years. Not only do they give an authentic look to a period decorating scheme, they can often be used day in and day out on modern telephone lines. There are two major classes of telephones; Local Battery, and Common Battery. Local battery phone service was particularly popular in rural settings since each phone provided its own power, rather than relying on power from a central office. A break in the phone line near the central office would cut that line off from the operator, but subscribers on the line would still be able to communicate with each other since they had an each independent source of power. Local battery service also provided an opportunity to customize the voltage for each phone on the line. For instance, a subscriber at the end of a 30km line could potentially require more voltage to make a call compared to a subscriber located next to the central office. As a result, some local battery phones used 3 batteries wired in series (4.5 volts), while others only required 2. Local battery phones were still commonly used in Canada into the 1970’s, and they find use today in some intercom type applications. Many people use vintage local battery phones to provide communications between different buildings on their property. The technology is extremely simple, and many local battery phones languishing in antique stores and flea markets can be made fully functional as an intercom simply through the installation of a couple of D cell batteries. Local battery phones were available in both wall phone versions, and as desk phones. Desk phones were normally connected to a subset that contained the ringing magneto, ringer, coil and condenser, while the batteries were generally housed in a separate holder that was connected to the subset. Unfortunately, local battery phones lack the appropriate circuitry to connect to the common battery phone lines that are in use today. As a result, certain modifications are required if you want to use a local battery phone for everyday use. An appropriate coil and capacitor combination (commonly called a network) will need to be installed, and for optimal performance, the cords may need to be replaced with modern reproductions. It is not uncommon to install a new transmitter as well in order to ensure distortion free operation. While it may be a compelling option to use a 100 year old vintage local battery phone on your modern phone line, it is important to ensure that any conversion is undertaken carefully so as to maintain the historical integrity of the item. There are a number of reputable restorers who specialize in this type of work. The other class of telephones are known as Common Battery. Common battery phones operate from power provided by a central office. Telephone lines of today are common battery, and most vintage common battery phones in good repair will work when properly connected to these lines. Prior to the advent of automatic dialing systems, operator intervention was required to complete a phone call. The subscriber would take the receiver “off hook” which would signal the operator. The operator would then come on line and connect the caller through a switchboard to the appropriate subscriber. Automatic dialing did away with the need for operator complete long distance calls until Direct Distance Dialing (DDD) was introduced in the early 1960’s. There were isolated instances where local battery rotary dial service was implemented in Western Canada. Common battery phones come in all shapes an sizes. Since they don’t require a magneto for ringing, they are generally smaller than the equivalent local battery counterpart. Early common battery phones, such as the Northern Electric Fiddleback, were made of wood. 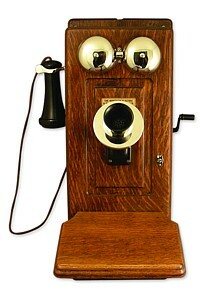 Candlestick type phones were common in the early 1900’s to the 1930’s, and the classic round or oval base phones of the 1920’s and 1930’s, such as the Northern Electric 202. Many early desk telephones made up until the mid 30’s did not contain the necessary circuitry within the phone to allow connection to the phone line. Instead, the coil, capacitor and ringer were located in a separate subset that was connected to the phone, and to the incoming phone line. Before attempting to connect a vintage common battery phone to a phone line, you should determine if it contains the appropriate components, or that it is properly connected to an appropriate subset. In the mid 1930’s, most telephone manufacturers began to make integrated telephones that contained all required components within the phone itself. One of the earliest phones of this type is the Automatic Electric Type 34 – a classic desk phone with very distinctive Art Deco styling. 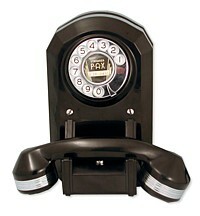 Type 34 Telephones were manufactured in the US, and in Brockville, Ontario, and the model was replaced by the similarly styled Type 40 in 1940. These models were both widely deployed by independent telephone companies outside of Bell territory. Northern (and Western) Electric came out with their venerable “302” series desk phone in 1937, and it has since become one of the most desirable vintage phones for everyday use. The “302” was produced in a variety of colours over the years, the early models being made from die cast zinc, while later war time models were made from moulded plastic. The “302” was widely used within Bell Canada territory during the 1940’s and 1950’s and they are therefore commonly found in Ontario and Quebec. The most common problem with vintage common battery phones is that they may not ring when connected to modern phone lines. This situation can be the result of a defective ringer, but more often it is due to the phone being configured for grounded ringing. A phone setup for grounded ringing will normally have three conductors in the cord that is used to connect to the incoming phone line. Two of the conductors (usually the red and green) are required on a modern system. The third (usually yellow) was a ground wire that was connected to one lead of the ringer, but it is no longer used on the phone system in use today. This problem can be easily corrected by moving the grounded ringer lead to either the Red or Green conductor on the line cord. This is generally accomplished where the Red and Green wires terminate on the L1 (Line 1), or L2(Line 2) terminal within the phone. Another reason that a vintage phone may fail to ring is that it may be equipped with a ringer that will not respond to the 20 cycle per second (CPS) ringing current put out by the most modern phone systems. 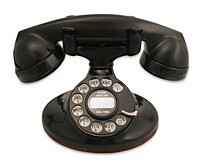 Many classic phones have frequency ringers that respond to different frequencies such as 30, 40, 50 or 60 cps. The ringers were designed for use on party lines and they allowed the central office to send a ringing signal that would activate only one specific ringer on the line. Frequency ringers were widely used by independent telephone companies outside of Bell territory, and they are therefore commonly found on telephones manufactured by companies like Automatic Electric, Stromberg Carlson, North Electric and Kellogg . Unfortunately, there is no easy way to modify a frequency ringer for use on modern lines, and the best remedy to this situation is to install a compatible 20cps, or a straight lineringer into the phone. Straight line ringers are not frequency specific, and they will therefore respond to a variety of ringing frequencies. Many people prefer to leave their vintage telephones in as-found condition, and this is clearly important if the maintenance of historical integrity is the collectors prime consideration. There are many phones, however, that would benefit either from a minor restoration or a complete refurbishing, and such work could do much to enhance the value of the item if undertaken carefully. Original parts for vintage phones are widely available from a number of dealers in Canada and the US, and excellent reproduction parts have been made for some of the common “consumables” such as mouthpieces, and cords. There are even external “dialers” available for phones that currently lack dialing capability. 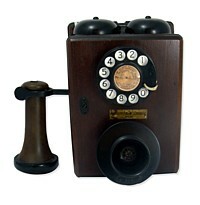 A quick search of the Internet using the key words “Antique Phones” will sturn up a number of sources for parts. 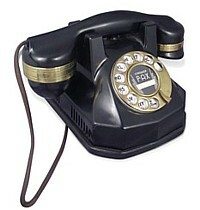 The most common comment about vintage phones relates to the quality of their construction. Unlike the modern phones, most vintage phones from prior to 1981 were owned by the telephone companies and leased to the subscribers. As a result, phones were designed and manufactured so that they would last, and they were often refurbished and redeployed many times during their life. Given this fact, it isn’t surprising that we can find fully functional 70-80 year old phones sitting in antique stores across Canada today. Don Woodbury is the owner of Oldphoneworks, a Kingston, Ontario supplier of Vintage telephones and phone parts. Oldphoneworks has a complete repair and refurbishing shop and in-house technicians to ensure fast turnaround. You can reach Oldphoneworks at 613-686-5849 or via email at oldphoneguy@oldphoneworks.com. Visit them on the internet at www.oldphoneworks.com.